We wanted the girls at church to have some fun decorating their own shirts this year, but we also wanted to have our ward name on the shirts. (Inexpensively due to rising fuel costs cutting into our budgets.) The theme for camp was "Building 101" about building your house of faith. Each ward was a different trade. 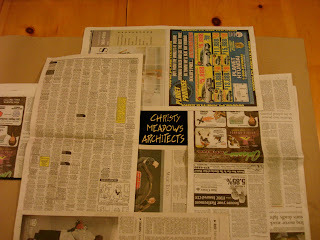 Our ward was the Christy Meadows Architects. 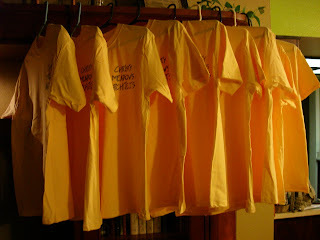 We got shirts for a great deal, less than $2.50 each and bought some "Simply Spray" to decorate them. 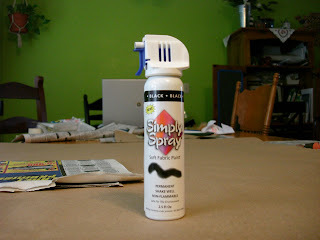 If you haven't worked with Simply Spray, it can be a little bit tricky. My first can was great, my second can's nozzle had a mind of it's own and it was a little gloppy but we made it work. 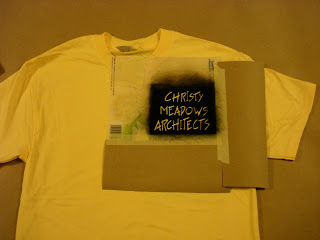 We bought black for the stencil and lots of multi colors for the girls to decorate their own shirts. 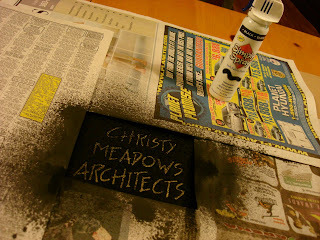 The first thing I did was make a stencil out of stencil plastic with my exacto knife. Then I covered the area that wouldn't be sprayed with newspapers, including a piece of newspaper in between the layers of the t-shirt to prevent the color from bleeding through. I lightly sprayed the stencil and dabbed up the excess with a paper towel. 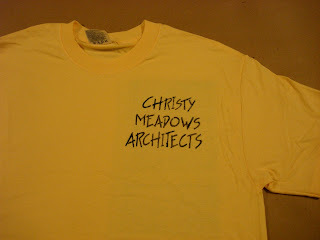 I made 32 shirts (I think). 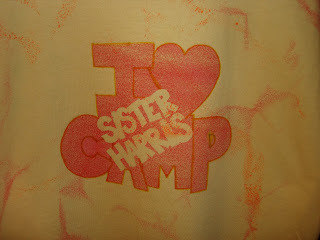 When we were personalizing them I made a stencil in a stencil, which I outlined with marker, that has my name and says "I heart camp"...'cause I do!! !